This was quite a startling revelation for me. 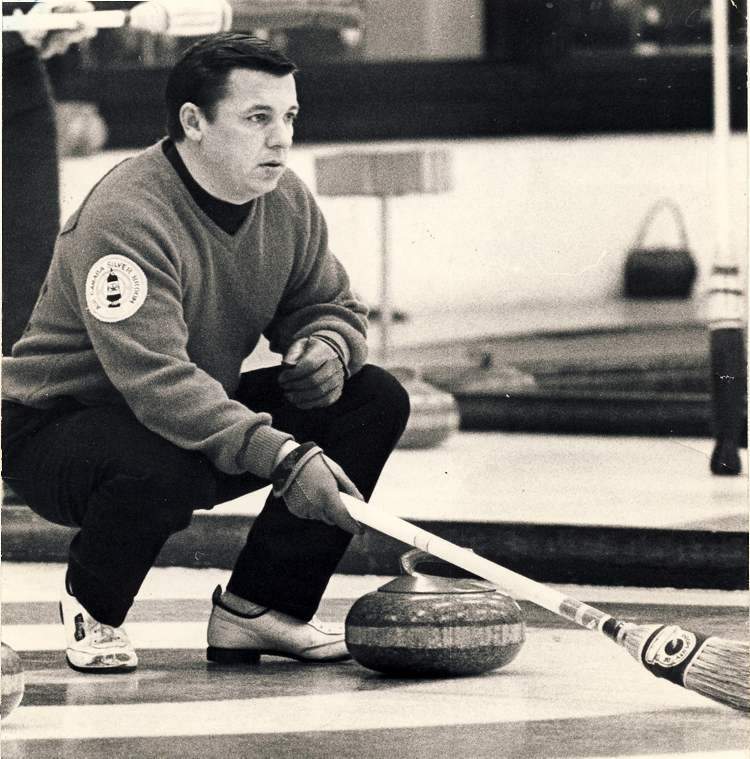 I mean, my first sports editor, Jack Matheson, informed me at the front end of the 1970s that Good Ol’ Hometown was the curling capital of Canada, if not the entire planet. I believed him because…well, Matty said it, so it had to be true. And, sure enough, a number of years later the Digit, Don Duguid, doubled down and confirmed that River City is the very heartbeat of all things pebble. “It’s the centre of it all,” the two-time world champeen assured me during a chin-wag at his main hangout, the Mother Club (The Granite), which sits on the banks of the murky Assiniboine River, a splish and a splash across the way from Osborne Village in Winnipeg. Yet, now, along comes Terry Jones to tell us that both Matty and the legendary Dugie were full of phooey. Jones writes that recent Scotties Tournament of Hearts winners Sarah Wilkes, Dana Ferguson and Rachel Brown of Edmonton are the “latest champions from the Curling Capital of the World.” He’s even writing a book about Northern Alberta supremacy: World Capital of Curling, an ode to E-Town’s most celebrated Pebble People. Well, doesn’t that just put my knickers in a twist. 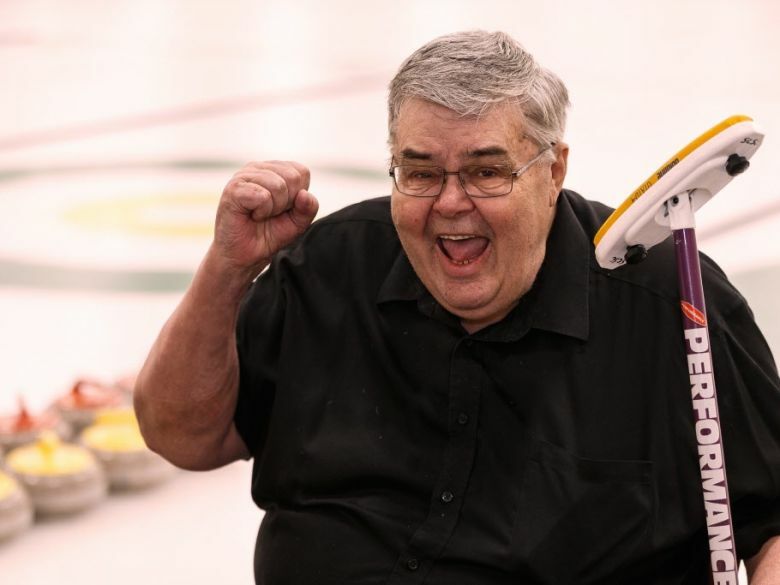 Being one of the Buffalo People, you see, I subscribe to the Gospel According to Matty, Dugie and Moosie Turnbull, which states, without equivocation, that Manitoba is curling’s Mecca. Thus I feel obliged to inform Jones that he is as wrong as Milan Lucic skating beside Connor McDavid. Before we go any further, I suppose I should introduce you to Jonesy. He’s a big-fun sports scribe of large girth and an equally large presence in E-Town. Hence the nickname Large. A good guy who began documenting the trials and tribulations of Edmonton jocks and jockettes before PM Justin’s poppa Pierre was the resident at 24 Sussex Drive in Bytown, Jonesy has heard and seen some things during his 50-plus years on the beat for both Edmonton rags, the Journal and Sun. Enough, in fact, to earn him membership in a handful of hallowed jock halls, including the Canadian Curling Hall of Fame. The lad’s got cred. Large cred (pun intended). What he doesn’t have, however, is evidence to support his notion. Brier champions: Winnipeg 25, Edmonton 18. Scotties champions: Winnipeg 12, Edmonton 4. World champions: (men) Winnipeg 6, Edmonton 7; (women) Winnipeg 3, Alberta 0. Olympic champions: Winnipeg 2, Edmonton 1. Totals: Buffalo People 48, Edmonton 30. So here’s the deal: Scotland is the cradle of curling, but Good Ol’ Hometown is the Curling Capital of the World. The notion that it’s Edmonton—sorry, Jonesy, that’s nothing but a (large) bunch of buffalo chips. The self-proclaimed title “Curling Capital of the World” rings rather hollow when one considers that Edmonton and Northern Alberta have yet to produce a world women’s champion. The best they’ve managed is bronze, by Heather Nedohin and Cathy King. I suppose it’s only fair to point out that the folks in E-Town turn out to watch curling in unparalleled numbers. They hold the record for highest head count at the Brier, the men’s world championship and the Roar of the Rings Olympic Trials. I’d be impressed, except that just tells me they got tired of watching the Oilers lose and decided to give curling a try. 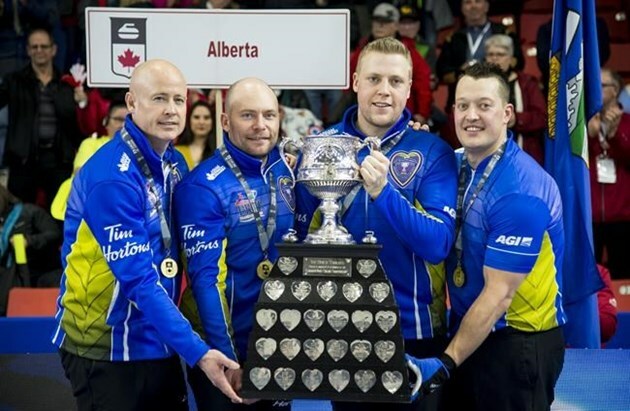 2019 Brier champs: Kevin Koe, B.J. Neufeld, Colton Flasch, Ben Hebert. Congrats to one of the Buffalo Boys, B.J. 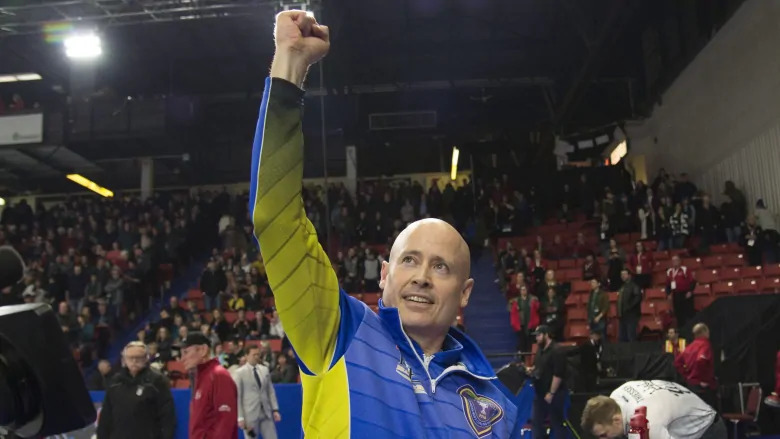 Neufeld, who slid third stones for Kevin Koe’s winning Alberta outfit at the Canadian men’s curling championship in Brandon. B.J. spent 11 years butting his head against a wall with Mike McEwen and pals playing out of the Fort Rouge Club in Good Ol’ Hometown, so it was boffo to see him get the job done. B.J.’s pop, Chris, was a member of Vic Peters’ Brier-winning team in 1992. It’s interesting to note that none of the lads who won the Tankard on Sunday honed his craft on Alberta pebble. Koe is from Yellowknife, Neufeld from Winnipeg, Colton Flasch from Biggar, Sask., and Hebert from Regina. They all eventually found their way to the Glencoe Club in Calgary. This just in: The 31 TSN “experts” who chose the 10 greatest male curlers of all time have lost their freaking marbles. Either that or they just spent an entire week in the Brier Patch at Westoba Place in Brandon, doing non-stop elbow pumps. I mean, good gawd. You’d have to be mind-numbingly pie-eyed to actually believe Dave Nedohin or John Morris were better curlers than Jeff Stoughton. You can include Wayne Middaugh and Marc Kennedy, as well. What will they tell us next? That Mr. Ed the talking horse had better giddyup than Secretariat? Hey, no knock against Nedohin, a good Buffalo Boy. But no way does he come out of Manitoba 11 times like Stoughton. 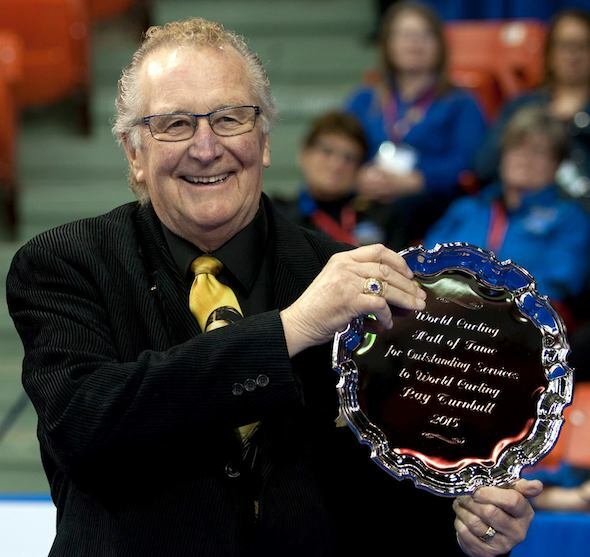 And he won two of his Brier titles when 18 of the top teams in the country were MIA, boycotting the event to earn a larger slice of the financial pie for curlers. As for Morris, he couldn’t cut it as a skip. Nuff said about him. Middaugh? Don’t even get me started. Kennedy? Good grief. Fact is, giants of the game like the Howard boys, Russ and Glenn, and Brad Gushue wouldn’t have worn the Buffalo at the Brier 11 times had they been based in Manitoba. I guess Stoughton and all those other Manitobans won 27 Briers by accident. Just as astonishing as the Stoughton omission, Kevin Koe was absent from the top 10. Yes, I realize the 31 “experts” did their voting prior to his Brier championship run in Brandon on Sunday, but he’d already done enough to get the nod over some of the men I’ve mentioned. (Seriously, John Morris?) 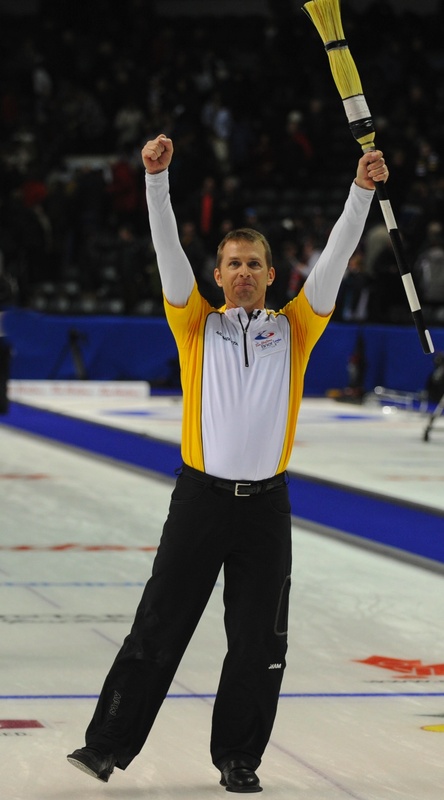 Now Koe has four Brier titles, with four different teams. A top-10 list without Koe or Stoughton? They might want to crumple that up, toss it in the trash bin and try again. And stop drinking! For the record, here’s TSN’s top 10 greatest male curlers: 1. Kevin Martin; 2. Glenn Howard; 3. Randy Ferbey; 4. Russ Howard; 5. John Morris; 6. Ernie Richardson; 7. Wayne Middaugh; 8. Marc Kennedy; 9. Brad Gushue; 10. Dave Nedohin. TSN: Vic Rauter, Cheryl Bernard, Bryan Mudryk, Bob Weeks, Kevin Pratt, Scott Higgins. Alberta: Warren Hansen, Con Griwkowsky, Renee Sonnenberg, Terry Jones. Saskatchewan: Devin Heroux, Stefanie Lawton. Manitoba: Jill Thurston, Ted Wyman. Ontario: Greg Strong, Mike Harris, George Karrys, Kevin Palmer, Mary Chilvers, Lorie Eddy. Quebec: Guy Hemmings, Marie-France Larouche. Nova Scotia: Mark Dacey, Mary Mattatall. Prince Edward Island: Nancy Cameron. Newfoundland and Labrador: Cathy Cunningham, Geoff Cunningham. And, finally, happy 73rd birthday to CJOB in Good Ol’ Hometown. They went on air on this day in 1946, just in time to broadcast the Winnipeg Blue Bombers’ last Grey Cup victory. Just kidding, of course. Worked at ‘OB for a brief time, with Friar, Knuckles and Kelly Moore. Terrific people.